Rosie Spaulding is no stranger to putting on a big show. After all, her experience includes work on little shindigs you may have heard of — like the America’s Cup yacht race and the 2012 London Olympics. 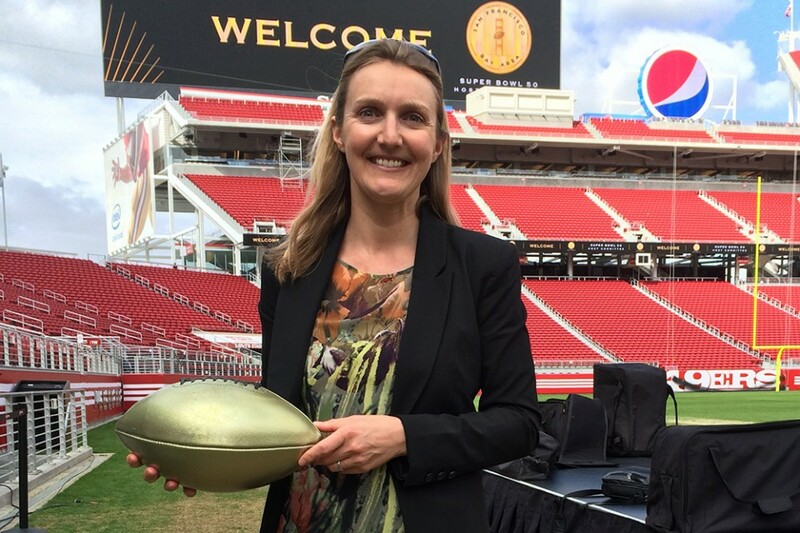 Spaulding is gearing up for another sporting event giant, Super Bowl 50, as the Vice President of Event Planning and Operations for the Super Bowl 50 Host Committee. Formed in 2013, the Committee is responsible for the planning and execution of Super Bowl 50 celebration events and preparation for the big game, which will be played at Levi’s Stadium in Santa Clara, California on February 7, 2016. And this isn’t just any Super Bowl coming up; this is the big dance in a benchmark year – the semi-centennial – with which Spaulding is charged. For Spaulding, for whom the term “football” holds an entirely different meaning (she’s English! ), being a football fan isn’t a prerequisite for the job, and is even beneficial: she can keep her focus squarely on the responsibilities of the job, and delivering a quality fan experience. That experience is not limited to Game Day, but an entire week of events leading up to it, including a free-to-the-public Super Bowl City fan village in San Francisco. While Spaulding is undoubtedly honing her wittiest responses to the barrage of requests for Super Bowl tickets she likely receives on top of taking on an iconic American sports tradition, she took time to talk to SharpHeels. Following are her insights about this big event. You were previously part of the planning team for the America’s Cup race (the Super Bowl of yacht racing), was planning similar? There are a lot of similarities in the planning and execution of major sporting events; our focus is always on the fan and how we can create an experience that is truly memorable. There is a tremendous amount of planning that goes into an event this large – we expect more than one million people coming through our activities during Super Bowl Week – so it’s important to have strong working relationships with all of your stakeholders. For these two events in particular, we are fortunate with the location being the same, so we’ve worked closely with many of the same public agencies, and are taking key learnings from the America’s Cup to help in the planning of the Super Bowl. What are the biggest challenges working on such an iconic event as the Super Bowl? I think we’re very fortunate to be working on Super Bowl 50. With 50 being such a milestone game for the NFL and the sport, we have been challenged and excited to develop new ideas and fresh ways of approaching a traditional event working in partnership with the NFL. We have the opportunity not just to look back and commemorate the past 49 Super Bowls, but also to look ahead to the next 50. What excites you most about being such an integral part of this event? Something that people might be surprised to learn is the commitment of our Host Committee to make this Super Bowl the most giving one ever. We are donating 25% of all funds that we raise to Bay Area non-profits. To be able to see that work firsthand and the difference that is making to people throughout the region has been quite amazing. 50Fund.org is something that I’m really proud of, and though I don’t have much to do with it, it was one of the things that made me excited to come and work with this team, because it’s not something that’s typical of previous Host Committees — or actually with sports, particularly, but we’ve made a big statement to be the most giving Super Bowl and to date. We’ve given away north of $3.6 million already through our 50Fund, so it’s all about giving back to Bay Area nonprofits. That’s something that we’re immensely proud of. The goal with Super Bowl 50 is really just to set a new bar! What’s the number one way you’d personally like to impact Super Bowl 50? The public experience is close to my heart in terms of motivating me in this role. What excites me about this position is engaging with the fan who might not necessarily follow football; to try and learn what we can do to engage with them and excite them not just about the sport, but the celebration of these major sporting events, and convert people who might not have been followers or might not have known too much about it, to then being fans in the future. How will being located in the Bay Area – technology and innovation hub – shape the Super Bowl experience? We will certainly be embracing our strengths as a region throughout the experiences that we deliver during Super Bowl Week. Technology and innovation are woven through everything that we do. For my part specifically, we’re excited to showcase that concept through the events and experiences (in Super Bowl City) that we put on. Being a region of culinary excellence and diversity certainly makes the experience even better; we are excited to share all that the Bay Area has to offer during Super Bowl week! What’s a differentiator for Super Bowl 50? What’s standout about this event in particular? We’re more about wrapping technology into everything that we do and thinking ahead – i.e. to not just do what’s been done in the past, but what the Super Bowl will be in the next 50 years, and having that vision about it in everything that we do. Unfortunately, we haven’t made any public announcements yet, but there are some pretty exciting activations, definitely on the technology side in terms of digital and social sharing, and it will be more technology-focused than Super Bowls past for sure. In looking on the Super Bowl 50 website, it appears that the women on the committee outnumber the men nearly 2:1 (!). Deliberate or just a matter of who was most qualified? We have carefully hand-picked a really strong team with diverse strengths that complement each other. I think it is just a matter of coincidence that the women outnumber the men, but it certainly speaks volumes to the skillsets of women in the Bay Area! Any tips for successfully working alongside such a (perceived) boys’ club as the NFL? I think it is more perceived than reality; most of the people that I work with at the NFL are women! Do you have any timeline or scheduling pointers for organizing these large events? I think a lot of it is really shifting priorities all the time. Every day, every hour, things change. So I would say first, set goals in the beginning that you stay true to all the way through. So, if you ever get to a road block or an issue, you can think ‘are these meeting my goals or am I going off the path?’ Setting those goals in the beginning is important, and then the milestones to get to those goals. In terms of the project management side, there’s a lot of detail tracking of your timelines and milestones, and that’s one piece of it. Then, it’s just (about) flexibility, because if there’s one thing with events we know, it’s that things change, and they change all the time, so being flexible and adaptable to shift and rearrange priorities and timelines and milestones is important too. What do you feel are best practices for working with local leadership and businesses? You’ve got to engage a lot with the local community in terms of community outreach, and that’s a significant part of what we do: try to listen and understand people’s concerns and the impact you’re making, and do your best to alleviate issues where you can. One of my teammates runs a program called BusinessConnect, a robust plan to engage minority-owned, women-owned, disabled-veteran-owned and also LGBT-owned businesses. So we, as the Super Bowl Host Committee, have made a pretty significant database and have a lot of networking and communication with these groups, and now every time, whether it’s the NFL or a sponsor or someone that’s not related comes to us, we’ll share that database. That’s something that’s important to us is to try to get visibility and business to some of these minority-owned businesses. It’s an NFL initiative, but something that, again, we’ve taken to a whole new level for Super Bowl 50. Do you have a go-to resource for your long days to maintain your stamina? Honestly, it’s like a marathon. There’s one thing that’s true about every day: it starts early and finishes late. Really, It’s all in the planning and there are things that are going to come up and that you need to deal with, but the better job you’ve done at planning, the better your chance at success, really. I do live on my coffee! Do you have a dream Super Bowl 50 matchup? I would love to see one of our local teams, the 49ers or the Raiders, play in Super Bowl 50. If it had to be one of them in a match up, I would probably go 49ers vs Indianapolis Colts. Finally, Super Bowl 50 takes place February 7, 2016. What are your plans for February 8? February 8 will probably be much the same as February 7 for me in that we’ll be extremely busy wrapping up. I’m certainly looking forward to some down time at some point in the Spring! I always try and make that happen because these positions are so intense; they’re like startups. We have a small team and we’re pretty lean, so it’s an intense seven-day-a-week job.